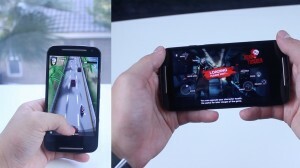 In this article we’ll be testing the new 2nd Generation Moto G with benchmarks tests and gaming performance. But before we get started I would like to know what other content you all are interested in, so be sure to let me know all of your suggestions down in the comments section below. Now the main attraction of this phone is of course the price, which is at an astonishingly low 179 us dollars. But for that low price tag you get the performance of most 500 dollar phones. Spec wise the Moto G is powered by a Quad Core Snapdragon 400 processor clocked at 1.2GHz, the Adreno 305GPU, and 1GB of RAM. The display is also improved from the previous gen as it’s now 5 inches and has a resolution of 720 by 1080. Starting it off with the benchmarks the first test we’ll be doing on the Moto G (2014) is 3D Mark. 3DMark simulates the high intensitity graphics of all the newest games and tests them on the device. In our case the Moto G was able to score 2840. Moving on to Geekbench 3 which is one of the most widely respected benchmark apps, this will test the pure power of the Moto G and also the memory. 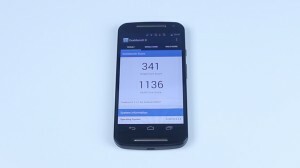 The Moto G finished with a single core score of 341 and a multicore score of 1136. To put that into perspective the iPhone 5S scores 1412 single core score and 2564 multicore. 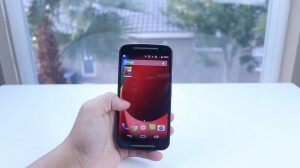 The final test we’ll be conducting is Antutu and here the Second Generation Moto G scored 17685. Finally I’m going to show off a more real world test with a Dead Trigger gameplay. So enjoy!